Frustration in Jewish Home party as support split between Rabbi Ariel, Rabbi Stav. The Bayit Yehudi (Jewish Home) party has made reforming the Rabbinate and Religious Services a key part of its platform. According to a party source who spoke with Arutz Sheva, the party is now split over how best to do that, with many supporting one candidate for Chief Rabbi while party head Minister Naftali Bennett supports another. The source expressed frustration, and accused Bennett of failing to discuss the matter with his party before deciding how MKs should vote. On Wednesday the Knesset discussed a proposal put forth by MK Elazar Stern (Hatnua) that would expand the body that elects Chief Rabbis to include 50 more people, including more women and public officials. The proposal is seen as potentially beneficial to Rabbi David Stav, a more liberal candidate who is opposed by the mainstream bloc of religious Zionist rabbis. A proposal put forth Tuesday by MK Zevulun Kalfa would lift the age limit for the post of Chief Rabbi, a measure that would allow Rabbi Yaakov Ariel to serve. Most of the party supports Rabbi Yaakov Ariel, he said, but Bennett and MK Ayelet Shaked support Rabbi Stav. 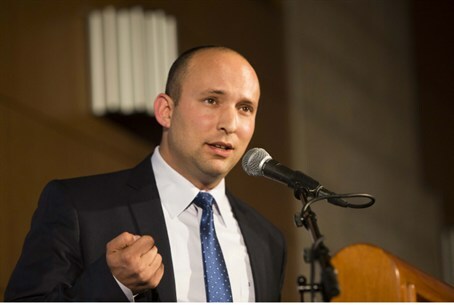 On Tuesday a different source in the party rejected reports that Bennett prefers Rabbi Stav, and insisted that Bennett thinks Rabbi Ariel is the best man for the job. Bennett’s bureau has refused to comment.